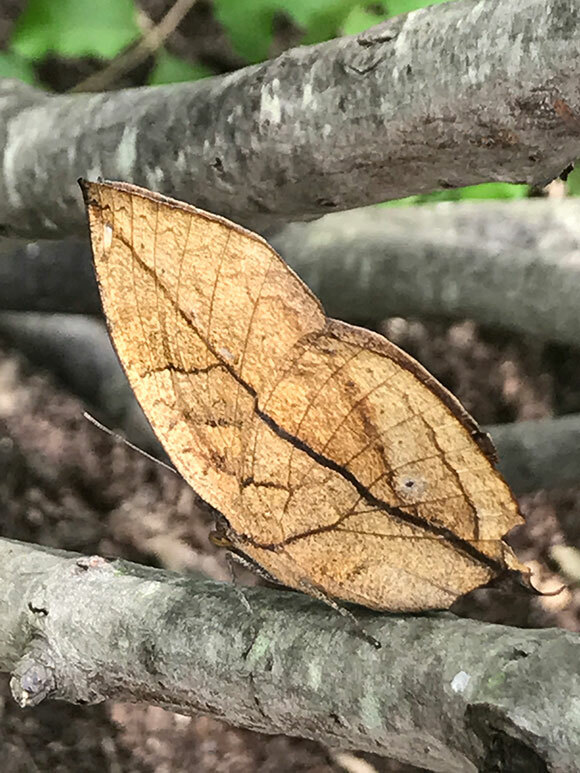 As the season has been progressing at Butterflies & Blooms at the Chicago Botanic Garden, we have been lucky enough to receive a very special butterfly species and a definite crowd-pleaser: the orange dead leaf (Kallima inachus). If we didn’t point out this character to guests, no one would ever suspect that they were looking at a butterfly. I like to describe the orange dead leaf butterfly as being able to mimic a dead leaf better than an actual dead leaf can. When it closes its wings, the butterfly has a perfectly ovate silhouette, complete with both a pointed leaf apex at the front tip and a petiole, or the stalk that attaches leaf to stem, on the hindside. The wing is a drab brown, with leaf vein arrangement very similar to that of a flowering dogwood. The orange dead leaf butterfly is at home in broadleaf forests of India, where it blends in with dead foliage during the dry season, going unnoticed by all but the sharpest predators. Here at Butterflies & Blooms, this butterfly seems to seek out dead, brown leaves in the tree canopies and uses them as a place to blend in. I always get a kick out of showing people that one of those dead leaves is not what it seems. The butterfly has another surprise for visitors: It has incredibly vivid coloration on the dorsal side of its wings. 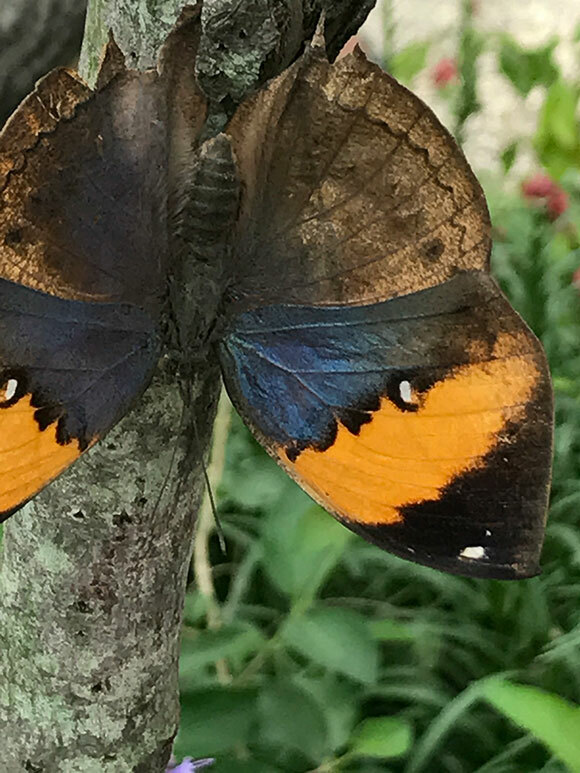 When the orange dead leaf opens its wings to sun itself or take flight, it shows off its navy blue iridescent wings, with a bright orange stripe on each of the forewings. We have several other butterfly species that also use one side of their wings to resemble dead foliage, including the autumn leaf (Doleschallia bisaltide) and the great orange tip (Hebomoia glaucippe). However, these species have not mastered the art of camouflage quite like Kallima inachus. Come over to Butterflies & Blooms to check out this fascinating butterfly. While you are here, take a look at the serviceberry tree just to the left of the pupae chamber. 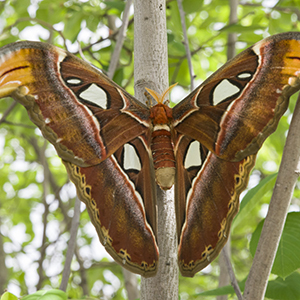 We have an unprecedented seven giant atlas moths perched on the tree branches like Christmas tree ornaments. Also, don’t miss all of the blooms: The recent rainy weather has undoubtedly helped the Butterflies & Blooms garden become more floriferous.